Have You Heard What Is Returning? No, I am not talking about the TV programs, but rather the Stampin’ Up! stamp sets. One of them is Country Home. To say the least I am thrilled. This stamp set gives us the opportunity to show off many of Stampin’ Up! colors. I am eagerly awaiting to find out the new colors. They will be revealed to Stampin’ Up! Demonstrators this coming Saturday at On Stage. I will be traveling to Minneapolis on Friday. 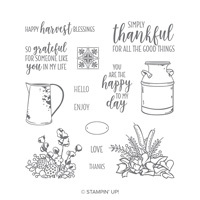 Just think by this time next Monday I will have the new 2019-2020 Annual Catalog, but you will need to be a Stampin’ Up! Demonstrator. It was the best thing I did because I have made so many friends and stretched my Stampin’ Up! dollar with my discount. Seeing this is my Fifth Anniversary Month with Stampin’ Up! you earn a Clear Block. As I said earlier Country Home is returning and chose it for today’s card and Color Challenge. So the colors are Blackberry Bliss, Daffodil Delight, and Tranquil Tide. By the way, Tranquil Tide will be retiring. The retirement colors and products will probably be announced next week. I will naturally bring you the information as soon as I hear. Yesterday I did my first Facebook Live. You will find the file at the bottom of this post along with other important information. Please don’t forget to sign up for my newsletter below. Yesterday I did Facebook Live. I was unable to load the One Sheet Wonder File. So here it is for you to create your own project. You can find my Online Classes by clicking here https://stampinpinkrose.com/april-online-class-this-little-piggy There are two different levels of Online Classes for April. Here is this weeks Color Challenge. Don’t forget to do it and send it to me. Then I will post any of challenge cards/projects on my blog Saturdays. Please send your project to my email [email protected] Each month I will draw a name for a prize. The drawing will be on the first of the month (if a weekend then on Monday. It will be a lot of fun for everyone to share ideas.